My wild thing left today for a week at camp, and I made excellent use of my quiet house. 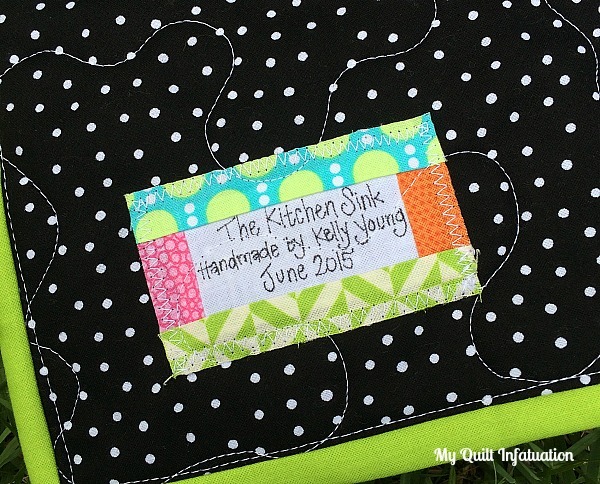 I finished up my latest (and final for a long time) scrappy quilt, aptly named The Kitchen Sink, since it literally has every last bit of my scrap fabric in it. 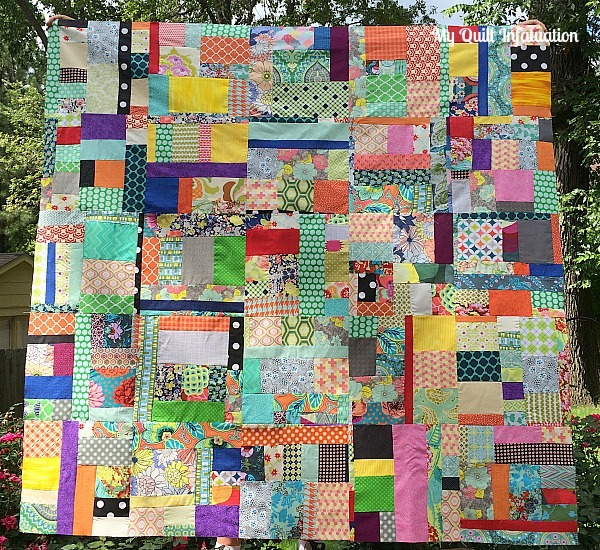 I used my favorite improv method to make short work of all those scrappy bits of goodness, and the 12 inch blocks went together in a snap. Seriously, if you've never sewn with reckless abandon, putting any and all fabrics together improv style, you have to give it a try. It is so freeing. My intention was to find a pretty gray polkadot for the backing, but clearly that did not happen. I couldn't find a gray that I loved, but this small black and white just begged to be used here. The colors in the scrap strip just jump out against it. For some reason, it photographs much busier than it is in person. 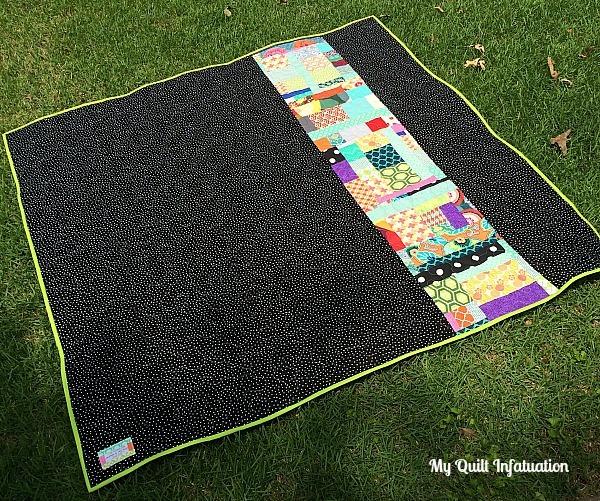 Every time I use black in a quilt, I worry that it will weigh it down and be "too much," and I always end up loving it. This time was no different. When I couldn't find a gray I liked, I agonized about using this much black, but I am so happy I did. See what I mean? This photo shows the scale of the dots much better, and you can see that it really isn't too busy at all. I also love the way the Kona Chartreuse binding pops against the black and white. I think it's the perfect frame for all of that crazy. 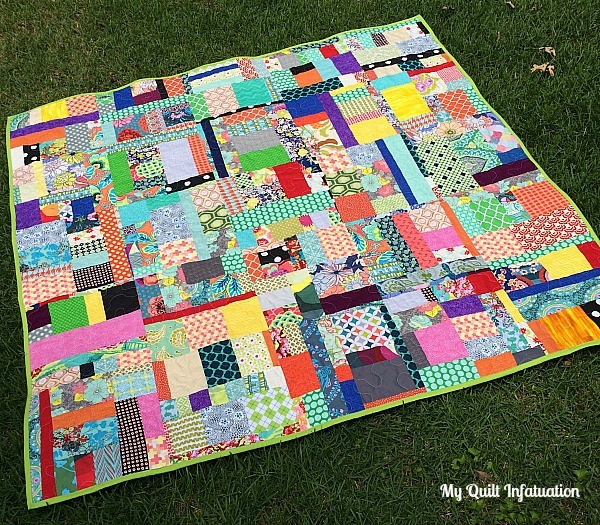 All in all, I love how this turned out, and since I already have queen sized Serendipity (the very first scrappy quilt I made like this), I'm planning to let this one go to a good home! Ahhh... After working on that huge, dark, heavy camouflage and orange quilt, it feels so wonderful to get back to myself and work on something light and happy. I've made it my mission every summer to use up my scraps. 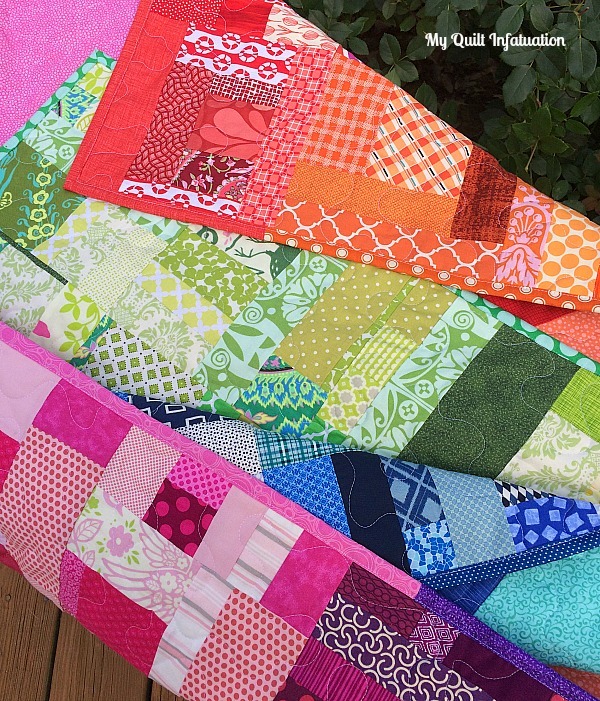 For the past two summers my Shattered Rainbow quilts have put the vast majority of them to good use, but left behind some of my most treasured scraps- the ones with too many colors to be classified into a single-color block. 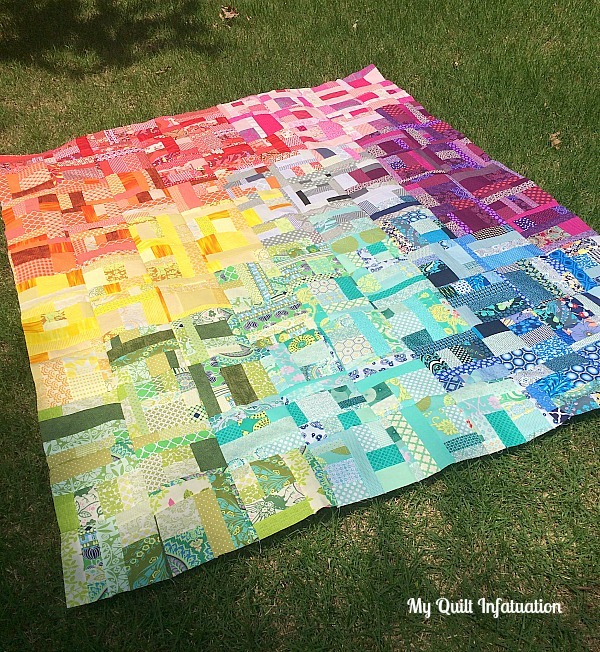 Color balance was important in my Shattered Rainbow quilts, so it wasn't feasible to include every bit of every single-color fabric in them, which is why the rest of those fabrics were thrown into this quilt as well. I really like how those fabrics break up all of the busy prints and give your eye a place to rest, though. I have no idea what I'm going to back this with. I have a strip of scraps for the backing, so the fabric can't really be too busy. I was thinking of a gray polkadot, and a shockingly bright shade of green for the binding. What do you think? Hooray! 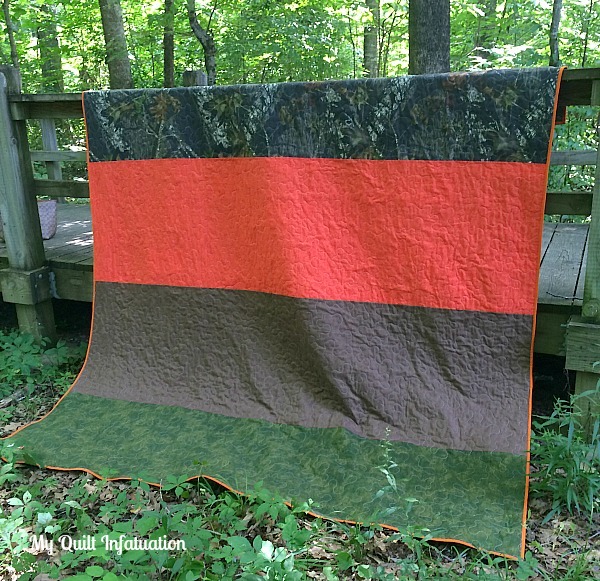 After some marathon quilting last night and binding this morning, I have finished the camouflage and orange quilt and it is all ready to be shipped out to its new home. 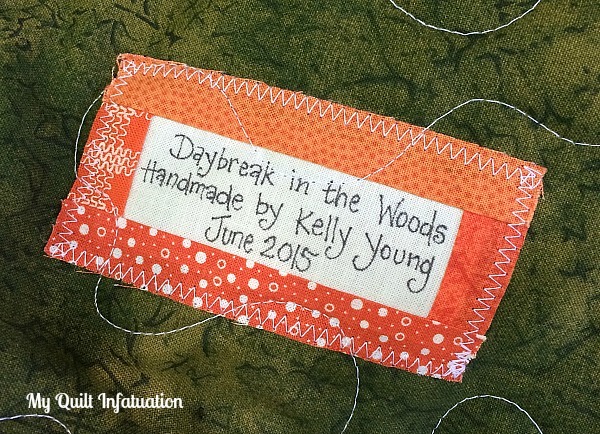 Since this quilt is for a hunter, I decided to name it Daybreak in the Woods. This quilt really was not my cup of tea, but I guess it would be unreasonable to expect that a teenage boy/hunter and I would share the same style. I hope it's just right for him! I went with wide stripes on the backing, with a large stripe of camo fabric at the top so that it will be very visible when turned down on the bed. 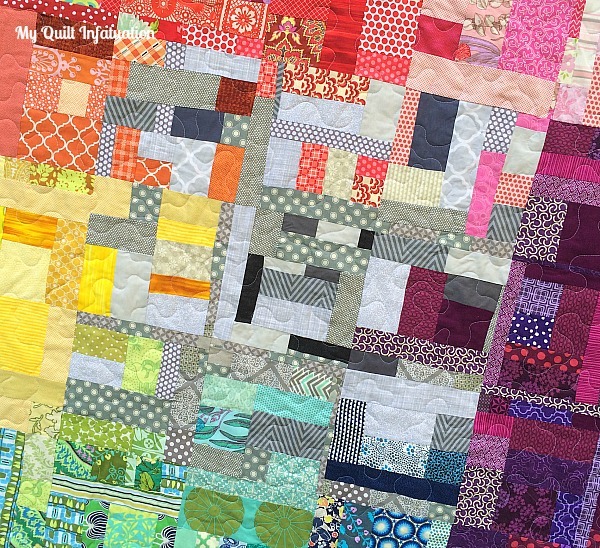 This quilt is a large queen size (about 85" x 100"), so it was a monster to quilt. It took some serious muscles to stipple this on my Bernina! 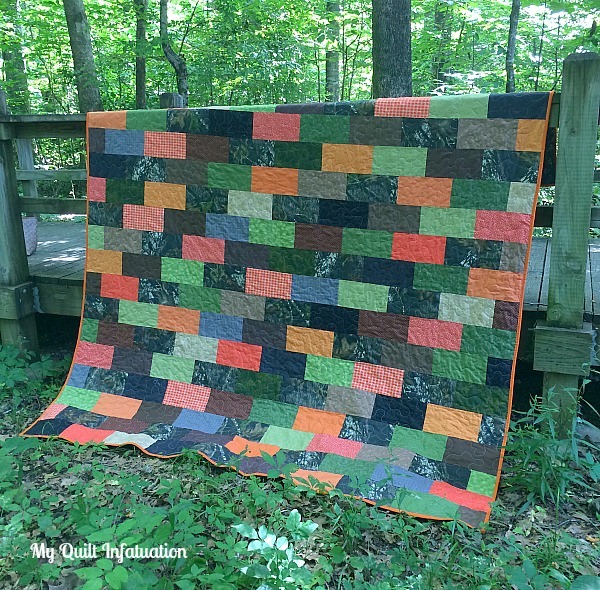 I felt like this quilt was so dark that it needed a bright binding, and I think the orange really does the trick. 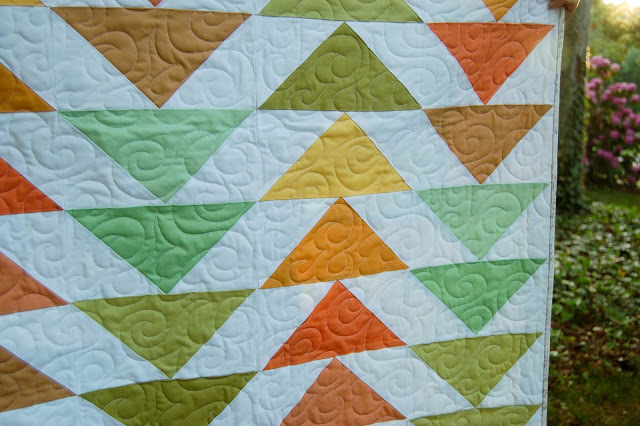 One thing I do like about this quilt is the depth that the various shades of orange and green create. 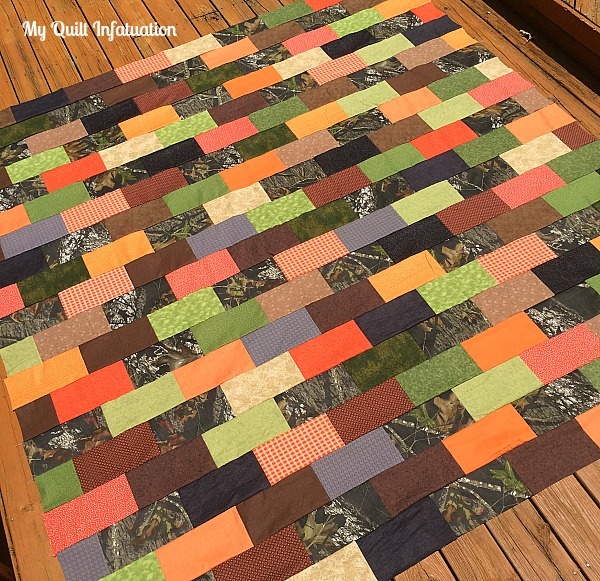 I really wanted the entire quilt to take on a pixelated camouflage look, and I think it works. This one is getting shipped off this afternoon, and I am so glad it is finished. I am ready to work on something girly! Welcome to Needle and Thread Thursday (on time this week)! I feel like it has been forever since our last party, but I guess vacation will do that to you. 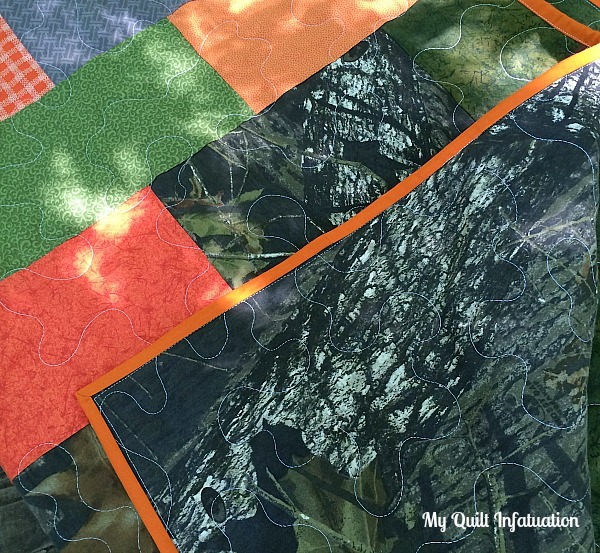 After vacation, I picked right back up with the camo and orange quilt I showed at our last NTT. I really just need to get it done so that I can move onto something more my style. I'm quilting it right now, and let me tell you- it is a beast. It is such a dark quilt that indoor pics just don't work, so no progress photo to show. I'm hoping to finish it, photograph it, and get it shipped out by Friday. 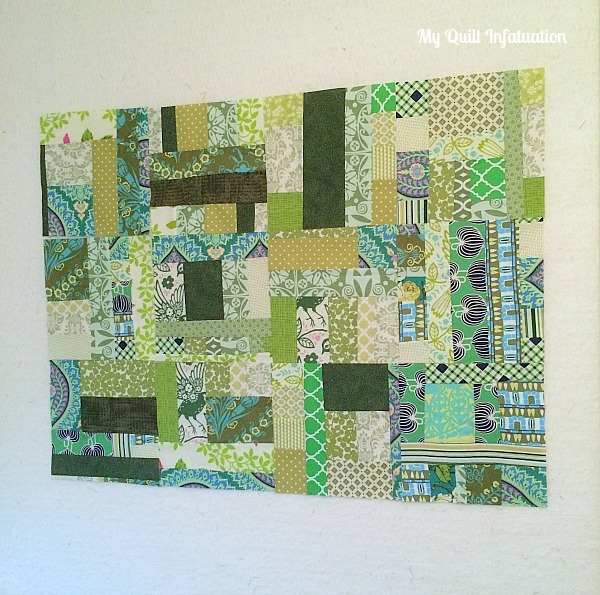 Ruth at Charlie and Ben's Crafty Corner linked up this single block quilt. She says it's frosty, but my mind is back at the beach with those beautiful shades of blue. 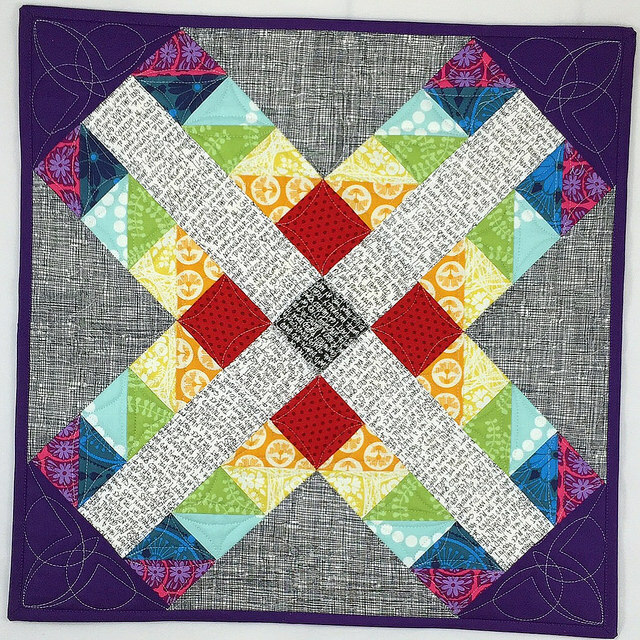 and Beth at Cooking Up Quilts showed off this hourglass beauty! Okay, y'all! 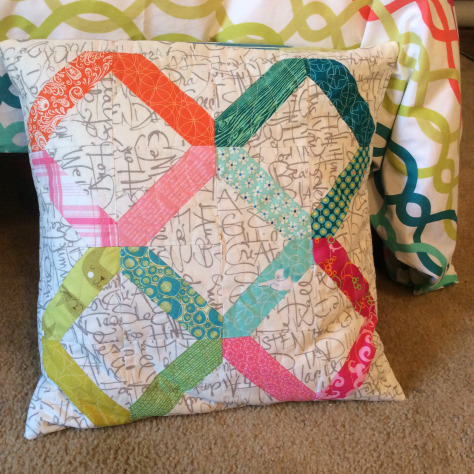 It's time to link up the latest from your sewing space! Do you ever focus so much on what you have to get done tomorrow that you completely forget the thing you have to do right then? That seems to be the story of my life right now. We are so busy running around, getting ready to leave for vacation tomorrow, that I completely forgot about NTT! I have decided to combine NTT with my June Fabric Deals and giveaways since I was planning to post that before leaving as well. Two birds, one stone...you know how it goes. 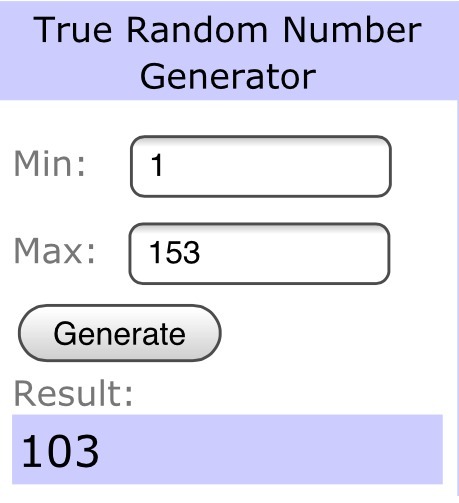 So, let's start off with the fabric news and giveaways! We'll start out with Shabby Fabrics! This month, they have several new collections in! If you're feeling patriotic, check out Let Freedom Ring by Nancy Gere for Windham Fabrics. Or, if you're like me and you like to get a jump start on you holiday sewing, NOW is the time. All of the new holiday lines are in, like Glisten, Merry Taupe, Holly's Tree Farm, Holiday Magic, and one of my favorites, Evergreen! 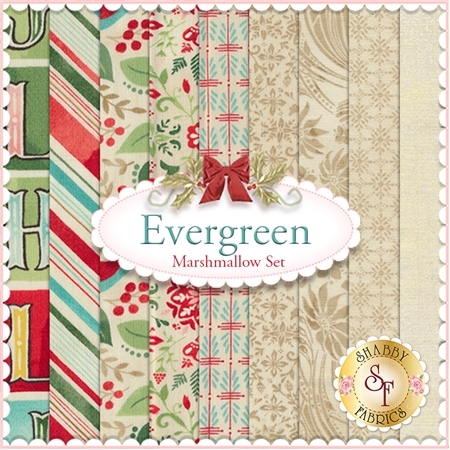 Shabby Fabrics is graciously offering a 9 FQ set of Evergreen in the Marshmallow color way. Aren't they beautiful? And it looks like they would blend easily with other holiday lines as well (which I always love). 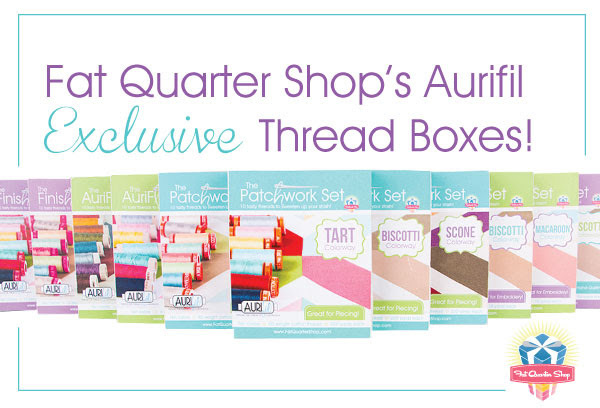 If you haven't heard, Fat Quarter Shop is now offering Aurifil thread boxes in three different weights, and in several color ways. 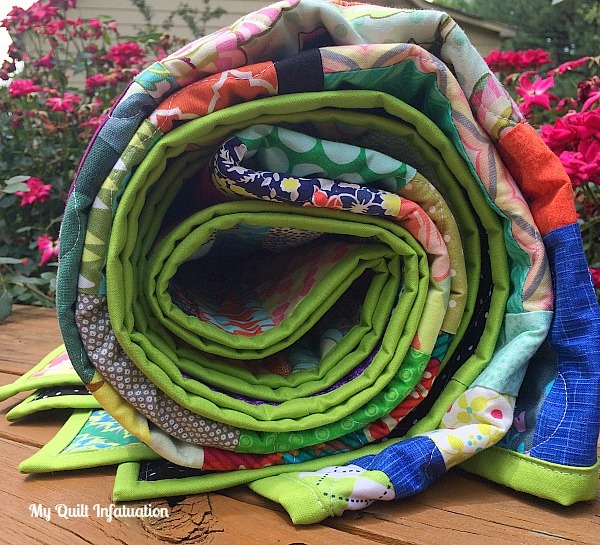 If you have never used Aurifil thread, you are missing out! 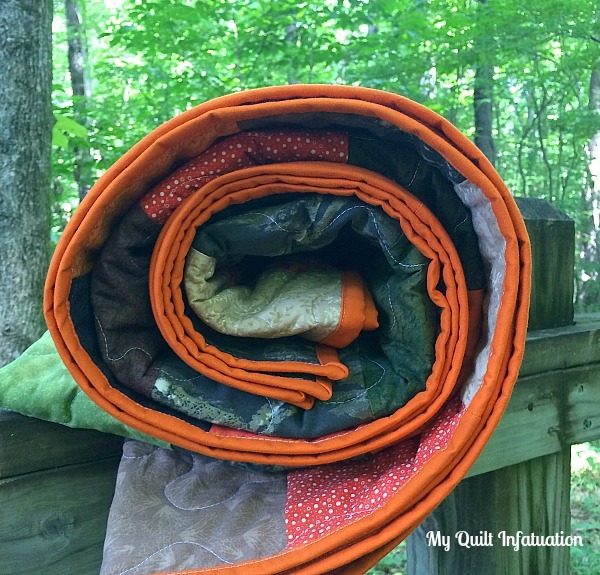 It is super-strong, produces very little lint to clog up your machine, and quilts beautifully. 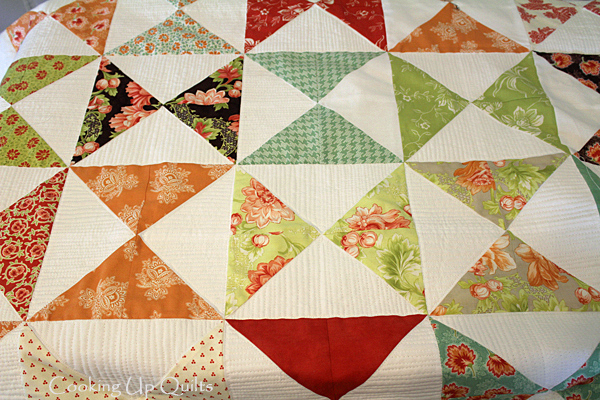 Fat Quarter Shop is the sponsor for the second giveaway of the month! 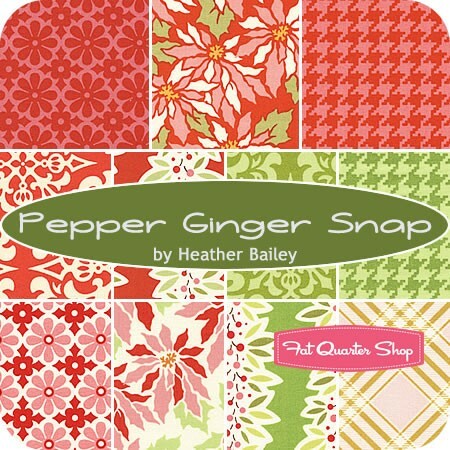 They are giving away a fat quarter bundle of Heather Bailey's Ginger Snap line, in the Pepper color way- gorgeous! To enter these two giveaways, just leave a comment on this post. Easy peasy! 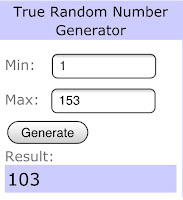 I'll use Mr. Random to choose winners next Sunday afternoon (6/21). Good luck to all! 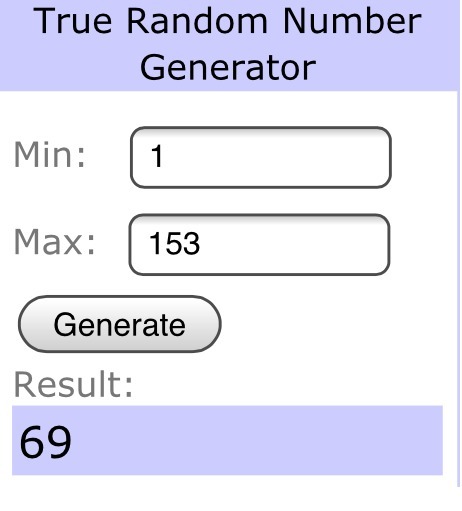 This giveaway has now ended. 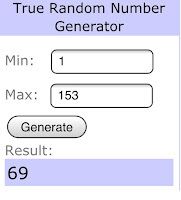 Thanks so much to all who entered. If you missed out, no worries. I host sponsor giveaways every month., so be on the lookout in July! So, let's switch gears and get to this week's NTT, shall we? 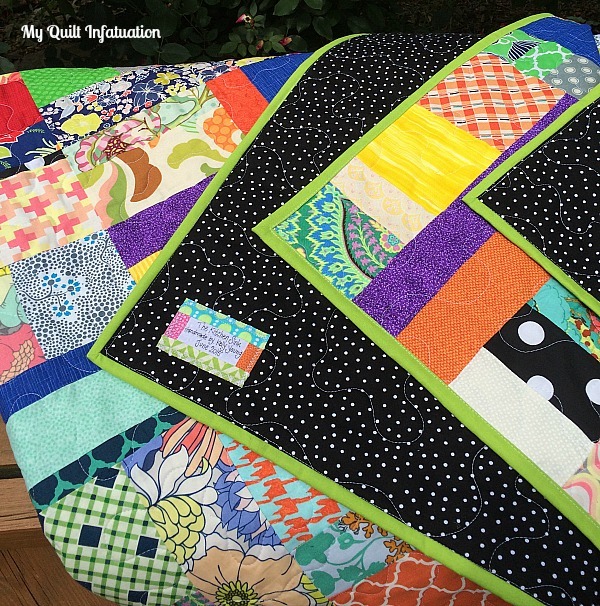 Amongst all of the laundry, meeting with the house/pet sitter, cleaning (in preparation for said house/pet sitter), and packing, I had one quilting goal this week- to finish this quilt top. 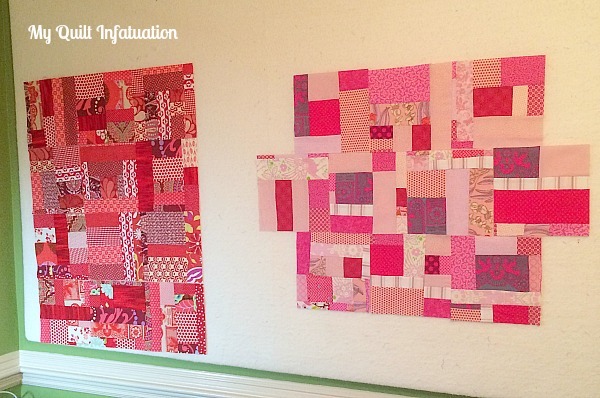 Remember Country Girl Chic, the camo and hot pink quilt, I made in the spring? Well, this one is its brother... literally. Country Girl Chic was for a teen girl who was redecorating her bedroom, and guess what? Her older brother wants one in camo and orange, and requested a brick pattern for his room. I have to be honest here. I am really struggling with this one because the fabrics are NOT my style at all, and unlike Country Girl Chic, the pattern doesn't really help them out. I had much more fun finishing up my latest Shattered Rainbow Encore quilt. On the plus side though, the brick pattern went together really quickly. 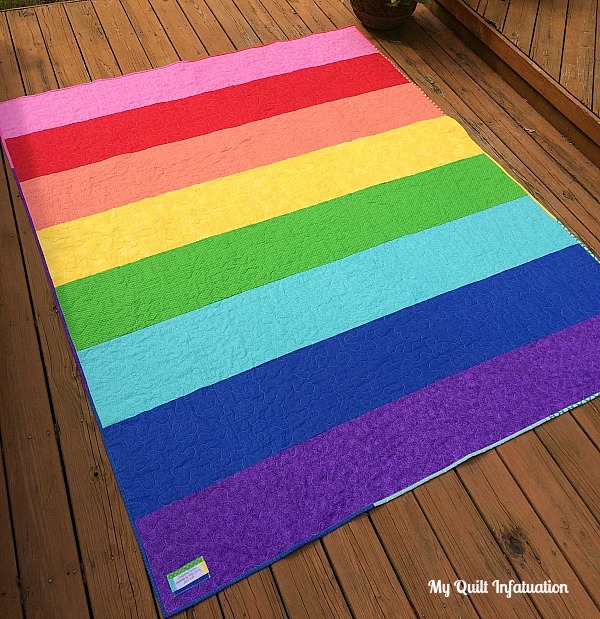 Last week's party had some real gems, like this rainbow mini, from Heather from Quilts Actually. 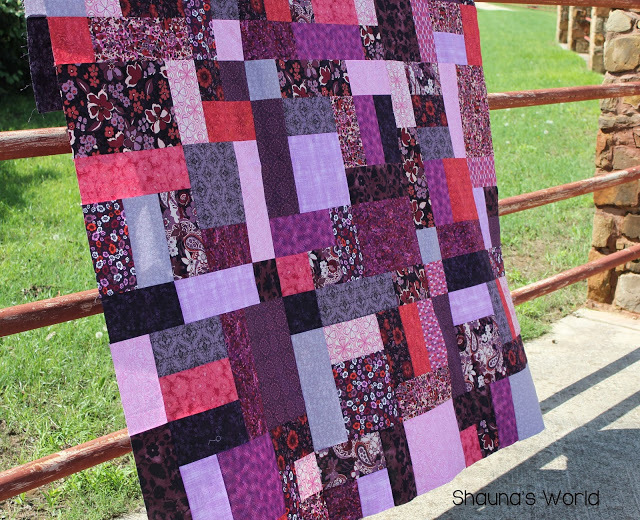 or this beautiful scrappy purple quilt from Shauna's World! There were so many lovelies linked up last week! I can't wait to see what you have going on this week! Let's party! *Also, note that NTT will be taking a vacation next week! See you again on June 25th! 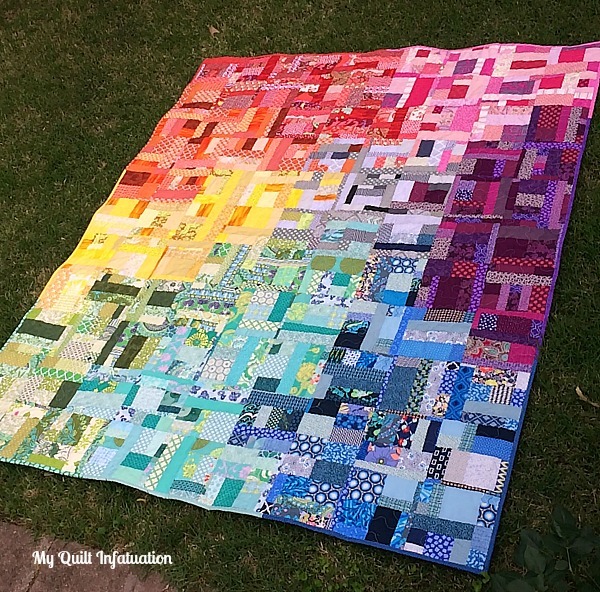 My second Shattered Rainbow quilt is finished, and let me tell you- I could not love it more. Although it is very close to the original, as the creator of both, there are a few differences (that may only be apparent to me). The biggest difference is the gray section. 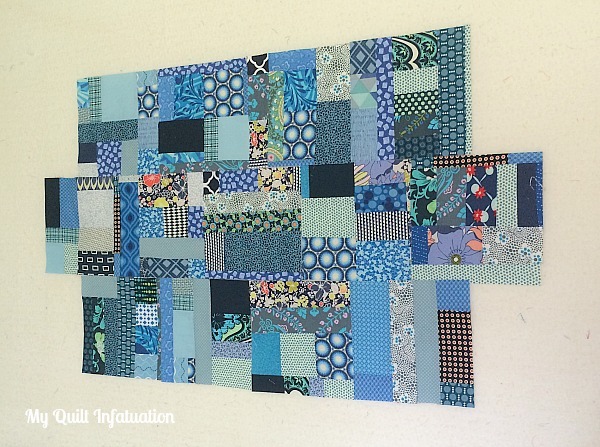 On this quilt, the grays make up nine blocks of the quilt. Only the center block is completely gray (with a trace of black). The other blocks around are a mix of gray and one other color. Each section of color is connected to its corresponding gray square, which really helps create the illusion of shattering the colors. 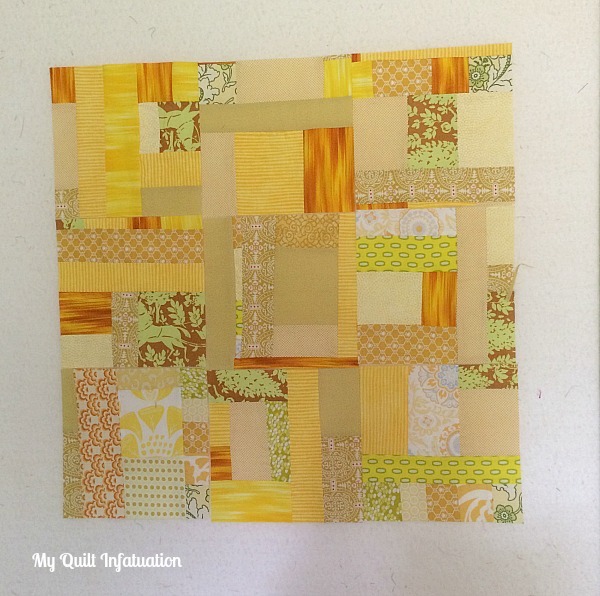 I worried a little bit about how this effect would really look within the quilt, but I think it really works well. The last thing I wanted was a big gray square. The second difference is the binding. 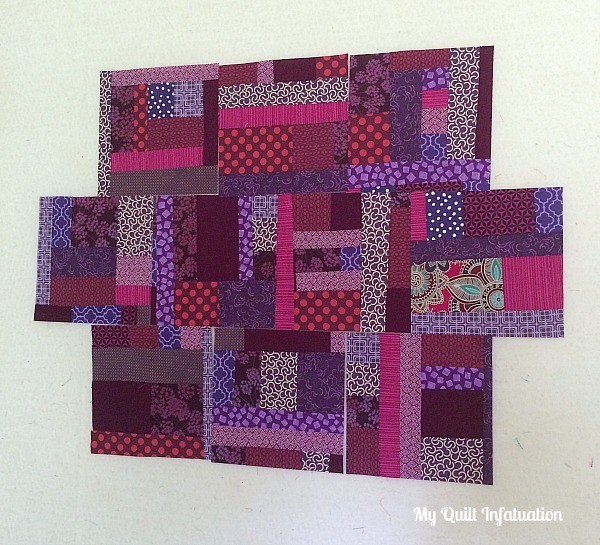 On both quilts, I planned the binding to correspond with the color sections of the quilt. As with most things, the second time you try something, it is often easier, and I was able to execute this much better this time around. The problem last time is that I planned the binding around the front of the quilt and sewed it together, forgetting that I would need to sew to the back of the quilt first. It turned out well on the first quilt, but not as precise as I would have liked. 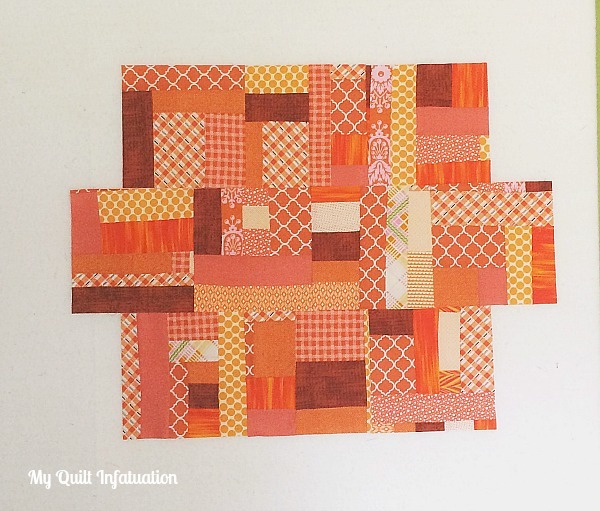 On this quilt, however, when the color spills over into the next section, it is only by an inch or two (like the pink and purple), and some of the transitions are perfect (like the red and orange). 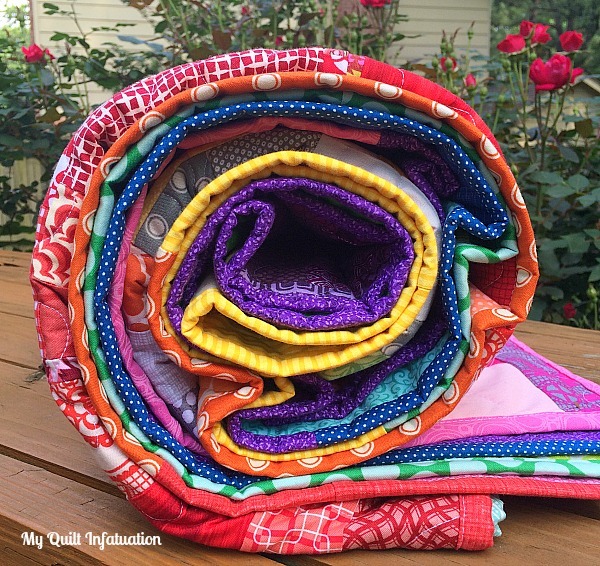 It is hard to fold the quilt in such a way that it shows all of the binding, but I got as many colors as I could in this shot. 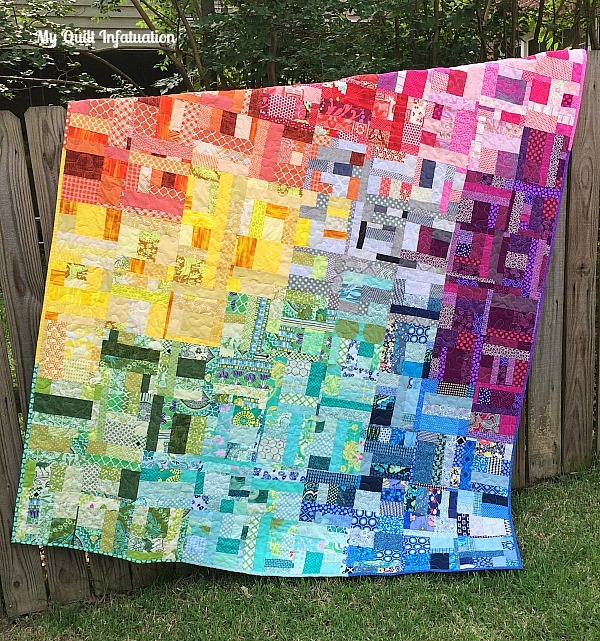 The backing is a shockingly bright, wide-striped rainbow, and I love that the orderly lines compliment the improv pieced front. I also managed to stipple without even the tiniest of puckers on the back of the quilt. 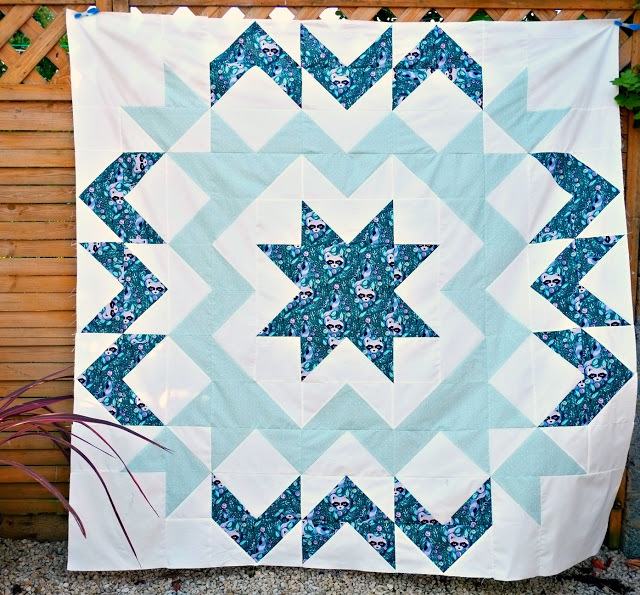 I am always grateful when I finish a quilt of this size without one, even though puckering is a super rare occurrence for me. 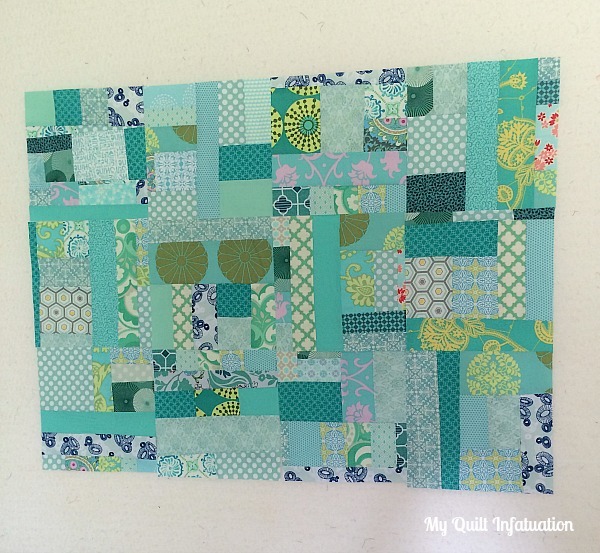 This quilt is 72" x 99" (full size) and I am absolutely in love with it. Plus, I made this one for keeps, which is even better!